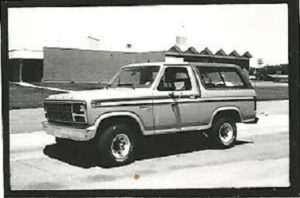 Unusually high gas-mileage figures being associated with the 1981 Ford Bronco may just be true. A 6-cylinder-powered Bronco with 4-speed overdrive transmission averaged 18.8 miles per gallon in a highway test I made. The Bronco is geared so high that at 55 miles per hour in overdrive it runs at only 1,650 RPM. The overdrive is a cruise gear not intended for climbing, and it requires plenty of downshifting. The engine is Ford’s 300-cubic-inch (4.9-liter) inline-6-cylinder. The ’81 model continues a smooth, soft ride with a Twin-I-Beam front axle and coil springs in front. A new feature this year is an automatic locking hub device in which the driver can shift the front hubs from free-wheeling to four-wheel-drive and back again at the transfer case without leaving the cab. The model I tested was purchased in March by Dan Pivonka, an Atwood farmer, from Leon Atkins Ford of Haxtun. Seating position is high in the front bucket seats. A key wll lower or raise the rear window, the spare tire swings away from the back and the tailgate drops down to the level of the cargo floor. The sticker price of $13,394 included air conditioning, AM/FM 8-track stereo, tinted glass, electric rear defroster, skid plates and boat hitch.